Los Angeles: More than 30,000 public school teachers in Los Angeles walked off the job on Monday to press their demands for better pay, smaller class sizes and more educators. The strike — the first in 30 years — is affecting some 500,000 students in the nation’s second largest school district, with intense negotiations in past weeks failing to lead to a breakthrough. The action is being watched closely by teaching unions across the country that are engaged in labor negotiations and also considering strikes. 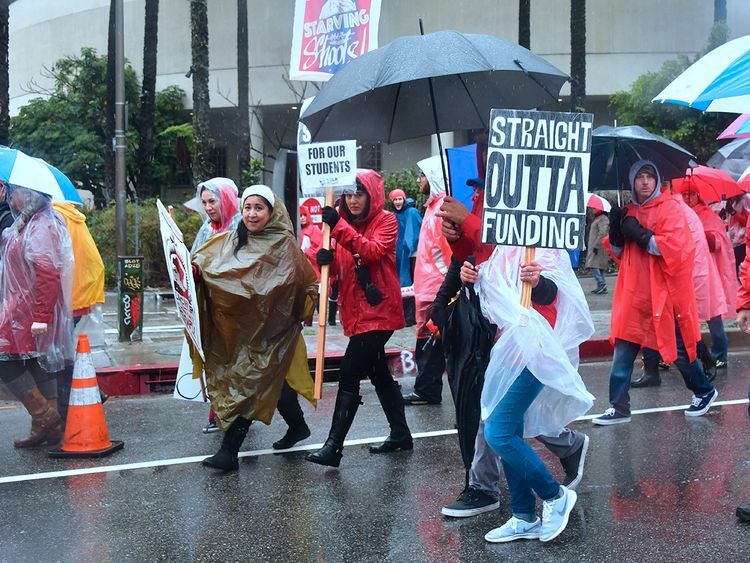 “Here we are on a rainy day in the richest country in the world, in the richest state in the country, in a state that’s blue (Democrat) as it can be — and in a city rife with millionaires — where teachers have to go on strike to get the basics for our students,” Alex Caputo-Pearl, the head of the United Teachers Los Angeles union, told a news conference. “Here we are in a fight for the soul of public education,” Caputo-Pearl added. Although the teachers’ union and the Los Angeles Unified School District (LAUSD) agree that class sizes — some at more than 40 — must shrink, teacher salaries must improve and more support staff are needed, they differ on funding. School district officials insist they have taken great pains to avert a strike and negotiate with the union and say the district simply doesn’t have enough money to meet all of the demands. A revised offer submitted on Friday and calling for roughly $24 million more in funding and 1,200 more teachers for the upcoming school year was rejected. LAUSD superintendent Austin Beutner on Monday said his office had reached out to the governor’s office and the mayor’s office to see if they could help broker a deal. He said the teachers’ demands would cost about $3 billion and push district into insolvency. Despite the walkout, the 1,240 schools in the sprawling district remain open, he said, with classes taught by administrators and substitute teachers. Last spring, a strike by teachers in the state of West Virginia over low wages and rising health care costs set off a wave of similar action in several other states and garnered strong public support. The walkout in Los Angeles could have a similar effect. In Denver, Colorado, for example, the teachers union has threatened a strike unless an agreement can be reached by the end of this week on salary conditions. Teachers’ unions across the country offered support for those striking in Los Angeles, with many educators and parents wearing red T-shirts in solidarity. Monday’s strike action also drew support from Democratic presidential hopeful Elizabeth Warren. “I support @UTLAnow & LAUSD teachers who are for fighting for better pay, smaller classes, & better resourced schools for our kids,” she tweeted. “When we fail our public school teachers, we fail their students — and we fail our future. I’m with our teachers all the way.